The most southerly community in Portugal and the most south-westerly in continental Europe is at Sagres, overlooking the Bay of Sagres, which is itself flanked by two headlands: Atalaia Point and Sagres Point. It is only when you catch sight of the grey ramparts of the fortress blocking off the massive plateau of Sagres Point and cast your eye around the 10 km arc of sheer cliffs to the lighthouse at Cape St. Vincent that you get a real feeling for the tremendous historical importance of this place. It was at least as important during the Age of Discovery as Cape Canaveral was during the early years of space exploration. When the weather is fair, it can be a powerful sensation to sit quietly anywhere along the clifftops here and look out to sea and ponder the extraordinary adventurers who have passed this way. It was to this place that the Infante D. Henrique, Prince Henry the Navigator, came in the 15th century to work on his obsession to push back the frontiers of the known world, and opened the phase in Portuguese history called The Discoveries. While precise information about Henry is far from complete, it is clear he was a most remarkable man. He was a prince, politician, warrior and grand master of the Order of Christ, but his fame endures mainly because of his monumental contribution to geographical discovery and the opening up of trade and cultural links between Europe and the East. When he arrived to settle in the Algarve as Governor in 1419 he was a young man of 25, austere and devoutly religious. A veteran of the invasion of Ceuta, he retained an abiding zeal to banish Muslims from North Africa and the Holy Land once and for all. While in Ceuta he had learned from traders about gold routes across the Sahara which were thought to originate in Guinea on the African west coast. Crusading reverence coupled with a thirst for gold revenue were soon to be augmented by an obsession to find Prester John, the legendary priest-king who ruled supreme amid fabulous wealth somewhere in Africa or the Orient. Religion and economics - God and gold - were the catalysts. Sagres was the crucible. The exact location of Henry's School of Navigation is not known. It is generally accepted that he sited his headquarters at Sagres and created a settlement on land granted by the crown. The settlement came to be known as Vila do Infante, or Prince's town. 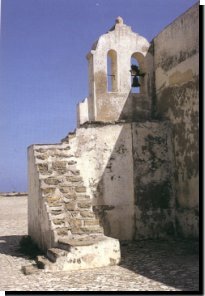 This is popularly believed to have been situated on the headland within the walls of the forteleza which were rebuilt after the 1755 earthquake. The only building still surviving and thought to have been around in more or less its present form in Henry's day, is the starkly simple little church within the fortress. The school of navigation was like a magnet to the best brains in Europe concerned with the nautical sciences. Under Henry's patronage, a community of brilliant scholars came here to teach and to study, and accumulated and correlated nautical knowledge as it was brought back by captains of successive voyages to hitherto unknown places. The scholars in turn instructed less experienced captains about Atlantic currents and wind systems and the latest navigational methods. Cartography was refined with the use of newly devised instruments. Maps were regularly updated and extended. A revolutionary type of vessel, the caravel, was designed. When Henry began master-minding and directing operations at Sagres and Lagos in 1419, the known southern limit of the Atlantic Ocean was the dreaded Cape Bojador in West Africa just below latitude 27ºN. 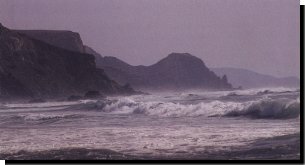 Apart from all the superstitions about seething serpents and monsters, it is notoriously dangerous because of the violence of its waves and currents, and the treacherous nature of its shallows and frequent mists. All this fuelled the deep-seated belief that if you rounded the cape, there was no possibility of return. Cape Bojador, therefore, was not only a dreadful physical barrier but a terrible psychological one. Many attempts failed before the barrier was finally overcome by the Portuguese in 1434. The first European captain to round Cape Bojador was Gil Eanes, of Lagos, and his heroic feat represented perhaps the greatest achievement of Henry's lifetime. Henry lived in the vicinity of Sagres for most of his life and this is where he died on November 13, 1460 at the age of 66. He had opened the way, but had not lived long enough to savour and share the successes of Bartolomeu Dias who rounded the Cape of Good Hope in 1488, and Vasco da Gama who finally pushed through the sea route to India in 1498. No doubt Henry would have been utterly fascinated too by the exploits of that other great voyager of the late 15th century, Christopher Columbus. He was 24 years old when by one of those quirks of fate he ended up on the doorstep of the Sagres school of navigation. He was with an armed convoy on its way from Genoa to England in May 1476 when it was attacked by pirates off Cape St Vincent. His ship went down in the ensuing fight and, though wounded, he managed to escape by swimming six miles to shore. How long he spent in the Algarve is not known. He is said to have spent some time recuperating in Lisbon, a city he came to know well. In 1478 he sailed from Lisbon to Portuguese Madeira as a buying agent for a major Genoese company. The following year he married the daughter of the governor of the island of Porto Santo in the Madeira group. That was where their only child, a son, was born. It was only after sailing to the Portuguese trading post of SAo Jorge da Mina on the Gold Coast (now Ghana) that Columbus got a real taste for exploration as opposed to mere business travel. It was then that the notion of voyaging westward to find new lands took hold of him and became all consuming. 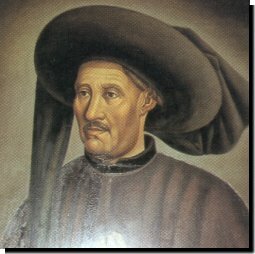 Only after the death of his wife, Dona Filipa, did Columbus leave his adopted country with his son, Diego, to seek sponsorship for his proposals from King Ferdinand and Queen Isabella of Spain. A deal was agreed after seven years of wrangling. And thus it was under the Spanish rather than the Portuguese flag that he discovered the New World. Columbus' introduction to Portugal back in 1476 was probably not the first and certainly not the last skirmish involving famous men off the Sagres and Cape St. Vincent headlands. That old sea dog Sir Francis Drake was very active in these waters harrying Spanish galleons returning from the Caribbean laden with treasure to fill Spain's war chest. Portugal was under Spanish rule at the time. 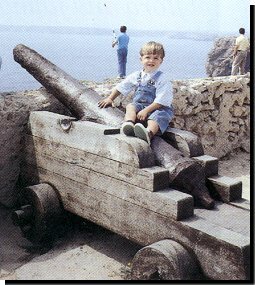 With preparations well advanced for the "invincible armada" to invade England in 1587, Drake was sent by Elizabeth I to "singe the King of Spain's beard" in Cadiz harbour 150 miles east of Sagres. After destroying Spanish ships as they lay at anchor in Cadiz he went on to raze Vila do Infante. Admiral Tourville with a French fleet of 71 warships defeated a British fleet commanded by Sir George Rooke off Cape St Vincent in 1693. The English admiral Sir George Rodney defeated the Spanish Admiral Don Juan de Langara here while on his way to relieve Gibraltar in 1790. In 1833, Sir Charles Napier on behalf of Queen Maria II of Portugal engaged a naval squadron supporting her usurper uncle, Miguel. The Miguelite squadron was captured and that effectively sewed up Portugal's War of the Two Brothers. Perhaps Napier had taken inspiration from a previous engagement, the most famous of them all, which is named after the cape. The Battle of Cape St Vincent took place on February 14, 1797 between a Spanish fleet under the command of Don José de Cordoba and a British fleet under Sir John Jervis. The Spanish fleet consisted of 27 ships-of-the-line in a state of neglect, drifting in disarray about 25 miles south-west of the cape, when Sir John arrived on the scene from Lisbon with 15 ships-of-the-line. He attacked the Spaniards without hesitation having ordered his ships into a single line ahead formation. To thwart their escape, the commander of the Captain acted without orders and broke from the line to put himself across the bows of the Spaniards. The young commander of the Captain who had shown such excellent judgement, courage and initiative was promoted to the rank of rear-admiral within days of this important victory. His name was Horatio Nelson. Nelson was very familiar with the imposing sight of Cape St Vincent and Sagres Point having passed this way many times, the last being in September 1805 on his way to Cadiz and then on to Trafalgar. The scene has not changed much since then.